Why Are the Rich So Damn Angry? In July, Pew asked Americans what they think about the amount lower income people pay in taxes. Only 20 percent think they pay too little, versus 34 percent who say they pay a fair amount and 37 percent who say they pay too much — a total of 71 percent. Pew also tells me that only 23 percent of independents, and 18 percent of moderates, say low income people pay too little in taxes, while big majorities of both say they pay a fair amount or too much. of conservatives are telling Romney that he’s wrong and urging him to back off. This appears to be partly for political reasons (do you really want to piss off elderly people on Medicare?) and partly for ideological reasons (tax credits for the poor are a conservative idea designed to make low-paying jobs more attractive). Either way, it suggests that maybe Romney won’t have quite the tea party problem that I thought. It all depends on which wing of the conservative movement turns out to be more powerful. The background to so much of the politics of the past four years is the mood of apocalyptic terror that has gripped so much of the American upper class….And what makes it all both so heart-rending and so outrageous is that all this is occurring at a time when economically disadvantaged Americans have never been so demoralized and passive, never exerted less political clout. ….Yet even so, the rich and the old are scared witless! Watch the trailer of Dinesh D’Souza’s new movie to glimpse into their mental universe: chanting swarthy mobs, churches and banks under attack, angry black people grabbing at other people’s houses. It’s all a scam, but it’s a spectacularly effective scam. Mitt Romney tried to make use of the scam, and now instead has fallen victim to it himself. The last 30 years in the United States have been better for the rich than any other time or place in human history. 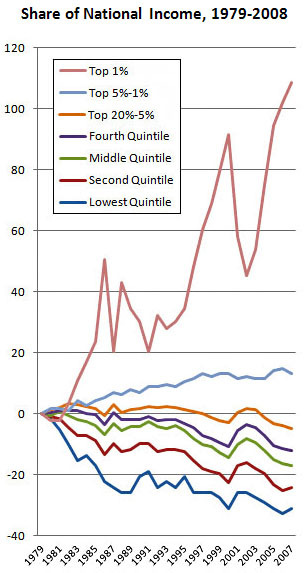 High-end incomes are up spectacularly. Tax rates are down. Welfare reform has been the law of the land for 15 years. Private sector unions are all but extinct. The wages that business owners pay to their employees have been virtually flat for more than a decade. For the rich, it’s been a golden age. And yet, America’s wealthy class nonetheless seems to be in an absolute fury. The looters want their money, the government is embracing socialism, the president who rescued the banking industry hates them, and their tax dollars are all going to support a bunch of freeloaders and shirkers. Where does this come from? Why are the very people who have done the best so angry? It’s mystifying.